Hearts’ Northern Ireland colony continues to grow, with three players and a coach now safely integrated at Riccarton. There may be more to follow before the summer transfer window closes, for there is good reason to recruit members of Michael O’Neill’s international squad right now. The Green and White Army reached the knockout round of last summer’s European Championship in France and are pressing hard to qualify for next year’s World Cup finals in Russia. If you are a Northern Irishman with even an outside hope of sneaking into O’Neill’s squad, this is the time to bust the proverbial gut. Hearts appear to have kept that in mind with their recruitment. Their assistant coach Austin MacPhee is also one of O’Neill’s international coaching staff and was instrumental in luring defender Aaron Hughes, striker Kyle Lafferty and full-back Michael Smith to Edinburgh. All three made their competitive debuts against Elgin City on Tuesday night and will start again tomorrow when the Betfred Cup group phase continues with East Fife visiting Tynecastle. “People see a pattern and just assume we’re going to sign every Norther Ireland player. 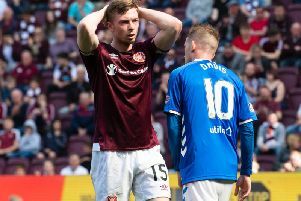 It’s not the case,” said the Hearts head coach Ian Cathro last week when asked about reports linking him with the Northern Ireland goalkeeper Michael McGovern. Cathro is understandably keen to widen the net, but Northern Ireland players and staff are a valuable commodity in the current market. “This period that we’re going through with Northern Ireland is an exciting time. It does give you that extra motivation at your club every week,” explained Hughes. “Knowing that if you stay fit, play consistently and get a bit of good form going, you’ve got a chance of maybe going to something as big as a World Cup finals. “That’s only the international side of things, remember. At a club like Hearts, with what they’re trying to do, there is the potential to win some silverware. That’s the aim of a club this size given the players we’ve brought in and the ambition there is here. “For us Northern Irish lads, we’ve got that double-edged motivation. You’ve got success with the national team at the minute and how good it would be to be part of that going forward. Club football can influence that, then there’s what we’re trying to do at Hearts this season. It’s a good position to be in. “It’s familiar faces and knowing what you’re getting from people. Not just the lads from Northern Ireland, I think all the signings we’ve made have been very good. Knowing the lads from the national team, I can see why they’ve been brought here. It’s not just their quality on the pitch, it’s how they fit in as characters within the dressing room. “You’re getting lads who know what to expect and how to deal with the type of football here. Laffs has played up here before and Michael can handle it. They’ve got experience of international football. Basically, you know what you’re getting from them week in and week out. MacPhee’s role is pivotal at Riccarton on a daily basis. Cathro is very much the public face of the club but MacPhee operated quietly in the background as a buffer between management and dressing room. “Austin is huge. He plays a big role in the background,” continued Hughes. “He’s around the lads making sure things are done properly. Him and the gaffer are very similar in their standards and what they expect. That’s why they work well together. They’ve seen good standards and where they can take you. In that sense, they know what good standards looks like. “Austin’s experience with the national team helps when you’re coming in here. When I first met him, I didn’t know him as well because he didn’t have as much influence with the team. That has grown now as well, both with the national team and here at Hearts. I’ve seen a lot more of him being much more hands on, taking training sessions and working hard. O’Neill residing in Edinburgh may also have been a pivotal factor for those joining Hearts. The former Hibs midfielder has changed the mentality within the Northern Ireland squad since taking charge five and a half years ago. No longer can players expect to be guaranteed their place. “Michael’s very good at keeping an eye on everyone, no matter where they are,” said Hughes. “Since he’s taken over with Northern Ireland, he’s been big on that. He doesn’t take it for granted that a player is at a club at a high level, he looks at the guys playing week in and week out. He knows that’s important for international matches, to have lads playing consistently and on form. The Northern Irish contingent will also do coaching staff at club level a massive turn if they can build on Tuesday’s successful start to the new season.